We are offering Ceramic Fiber Rope. Ceramic Fiber Cloth is a compression packing for very high temperature duties. It is manufactured from an exceptionally stable fibre material that is soft, non-irritating, non-hazardous & is not limited by World Health Organisation or European Union restrictions. - Non-metallic Ceramic Fibre yarn braided packing rope. 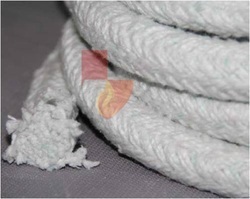 - Non-metallic Ceramic fibre yarn twisted packing rope. - Metallic Ceramic Fibre yarn braided/ twisted packing rope. - Ceramic fibre Fire & Flame protection blanket. V. Dipesh Kumar & Co. 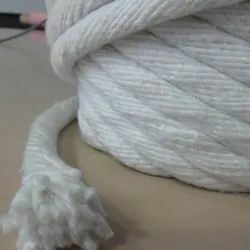 Braided by ceramic fiber yarns, contain core rope and out layer.According to the different working termperature, the out layer is braided by different ceramic fiber yarn with S.S. wire or fiberglass yarn.It is used as heat insulation materials and an excellent substitute for asbestos rope. We have gained a remarkable position in the market that is involved in offering Ceramic Fiber Rope.